Pair with your favorite light polish, AIO, glaze, wax or sealant. Brings out a deep glossy finish with ease! The Lake Country CCS Black Finishing Pad will help you finish down your paint and bring out that amazing level of clarity with ease! This pad is made of a unique urethane foam formulation and it is extremely soft, making it the perfect pad to pair with your favorite light polish AIO, glaze, wax or sealant. Traditional foam pads tend to absorb polish too quickly, reducing performance because the polish is trapped below the face of the pad. The CCS Technology solves this problem with partially closed foam cells, or dimples on the face of the pad. These pockets capture and gradually release polish as needed during the polishing process. This feature tends to reduce surface tension, pad skipping, and heat generation with less surface area on the face of the pad being in contact with the painted surface. Less surface area means less friction, which in turn increases polishing performance! 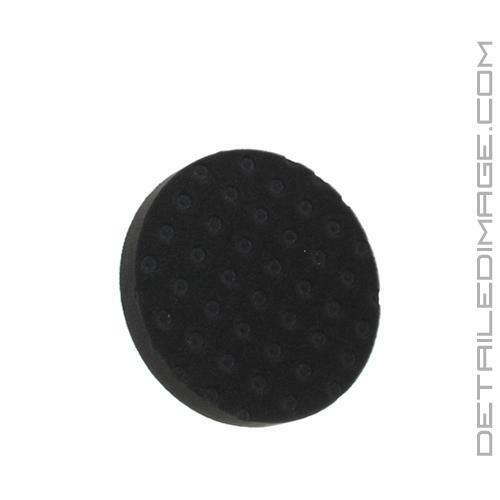 All Lake Country CCS Pads are made from the same exact foam as the flat versions, which means no confusion on which color will perform which polishing job. The Lake Country Black pad comes in a flat version (no CCS dimples) as well. If desired, you can purchase the flat version in 2", 3", 4", 5.5" and 6.5" sizes. If you are looking for a great finishing pad, look no further than the Lake Country CCS Black Finishing Pad! Glad to see the CCS pad added to DI! I prefer this pad over the flat black finishing pad, it seems to hold it's shape better. A great pad for final sealant application, plus it gives a little cleaning action on daily driver cars that could use a polish (but the owner chooses not to pay for that).